Business continuity, especially across data centers in nearby locations often depends on complicated scripts, manual intervention and numerous checklists. Those error-prone processes are exponentially more difficult when the data storage equipment differs between sites. Such difficulties force many organizations to settle for partial disaster recovery measures, conceding data loss and hours of downtime during occasional facility outages. real-time between unlike storage devices. • Non-disruptive failover between stretched cluster requiring zero touch. • Rapid restoration of normal conditions when the facilities come back up. *Gift card will be sent within 10 days of the webinar date. Void where prohibited. The short half-life of data, quickly decaying from hot to warm to cold, governs how much you should spend on it throughout its stages. Humans are poorly equipped to track the rapid temperature changes, much less capable of reacting to it. Consequently, largely dormant data consumes precious space on expensive storage, blowing up disk capacity and spiraling up costs. Join us to hear the story of City of Carmel and Mirazon. City of Carmel is one of the fastest growing cities in Indiana. Carmel was voted #1 in American's Best Places to Live by Money magazine. CNBC voted Indianapolis/Carmel ”Best Cities to Relocate to in America”. Over the last two decades the city has almost tripled its population and this growth has forced their IT infrastructure to expand rapidly. Thanks for Mirazon’s recommendations they found the perfect solution that helped them modernize their infrastructure to provide 24/7 data access for Fire and Police department’s critical systems. For nearly a decade, City of Carmel has experienced Zero storage-related downtime. Even through maintenance windows, their VM’s have achieved 100% uptime. The best part is, they have done with budget-friendly backend disks and allowed Software-defined storage to do all the heavy lifting. They have enjoyed Enterprise level active/active HA functionalities across 2 different buildings, running a VMware stretch cluster with HPE Servers connected via 10Gb and HP MSA backend enclosures. Learn how City of Carmel has been able to stay running without downtime for almost 10 years and have saved $75,000 by extending their hardware life expectancy thanks to their secret sauce. Hyperconvergence is now adopted by an ever-growing number of enterprises because of its simplicity, but others don’t like it because of its lack of efficiency, or because they do not find it flexible enough to answer to all of their workload needs. Yet, it is not always possible to get everything you want. However, technology and products are quickly maturing, and now enterprises can ask for much more. Attend this free GigaOm webinar featuring experts in enterprise data storage and IT infrastructure, including GigaOm Analyst, Enrico Signoretti and DataCore’s Sr. Product Manager, Manish Chacko, discussing innovative solutions for infrastructure strategies. Join GigaOm and DataCore for this free expert webinar! Data is a strategic weapon of any institution or business. But, if you’re not leveraging it, then it can be a massive competitive disadvantage in the industry! So how can you, and your IT organization, gain this advantage? A transformation must occur. Maximizing IT infrastructure flexibility is paramount to keep pace in this newly formed digital age. But typically, any major change in your IT infrastructure, besides costs, requires risky, time consuming and disruptive data migrations. So how to overcome this obstacle? Join our brief webinar and Q&A at the end to hear more about the background, drivers and enablers to achieve IT modernization and flexibility without the pain of migrations. In other words: to disrupt without disruption. Experts from ESG and DataCore will jointly look at the challenges associated with the need of IT modernization and how it can be accomplished – within budget and without any disruption for your operations. Join us to hear the story of 1st Basis Consulting and MNJ Technologies. 1st Basis Consulting offers technical managed services and IT consulting in support of SAP and VM solutions. As a company providing hosting services for customers worldwide, 1st Basis Consulting needed a solution to maximize the performance of their SAP HANA test/dev environment and reduce their storage costs. With the help of MNJ technologies and DataCore Software, 1st Basis Consulting found a high-performance solution that helped them reduce storage delays by a massive 75% and cost savings of 50% during their hardware refresh while also decreasing their hardware footprint by 42% and increasing their VM density. Learn how 1st Basis Consulting transformed their SAP HANA environment from a traditional-SAN storage design to a modernized 2-server Hybrid-Converged solution with HA, plus the ability to present virtualized storage to external VMware hosts. The “new normal” is an expectation of 100% uptime of applications and long-term retention of data. Coupled with massively growing data sets, IT organizations are struggling to meet these expectations. As an IT professional, you are looking for innovative data protection and disaster recovery solutions to overcome these hurdles, but where do you start? You simply don’t have time to research and compare the latest software and hardware solutions available for enterprise data protection. Leave the hard work to us and join us on the Data Protection, Disaster Recovery, and DRaaS Megacast! This single event will help you learn about the latest and most innovative data protection and disaster recovery solutions. In this educational event, you’ll learn what makes each solution unique as well as how they improve your company’s reliability, availability, and efficiency. You’ll learn how each vendor makes data protection easy and how they make disaster recovery fast, reliable, and efficient. Register now to join us for this fast-paced, fun, and prize-filled event! Join us to hear the story of Architectural Nexus, Inc. and Universal Systems Incorporated (USI). ArchNexus provides customized architectural, landscape and interior design services. As a company with over 100 power user engineers and architects, ArchNexus needed a storage solution to meet the company’s high demand for performance. With the help of USI and DataCore Software, ArchNexus found a smart and affordable storage solution. Are you searching for a smart storage solution that is right for your business? Please join us! Did you know that unplanned downtime at a healthcare organization can cost an average of $7,900 per minute? This is a fact reported by the Ponemon Institute. Are you forced to replace your hardware? Are you thinking about different deployment models for your IT infrastructure, e.g. hyperconvergence? Well, any change to your IT infrastructure is a major challenge, and typically requires complex data migrations, resulting in service downtime, overtime and more money to spend - but are the results worth it? Before you start your next project, think about an alternative approach to rip-and replace, like software-defined storage. You may ask yourself, why should that help me? And there are many good reasons, but an essential one are the unrivaled chained migration options. IT organizations require a data protection solution that can combat against the ever looming threat of malware or ransomware, and data corruption, which can have a significant effect on day to day operations. When that data protection capability is included in their storage solution, it allows IT organizations to reduce their overall costs, while maximizing their ability to protect all data they are responsible for. This is why DataCore Software created Continuous Data Protection (CDP), or the “undo button” for your data. In this webinar we explain and show how DataCore Software’s CDP feature can deliver one-second restore granularity and provides the best Recovery Point Objective (RPO) of any data protection solution. NVMe and all-flash systems can solve any performance, floor space and energy problems. At least this is the marketing message many vendors and analysts spread today – but actually, sounds too good to be true, right? Like always in real life, there is no clear black or white, but some circumstances you should be aware of – especially if you intend to leverage these technologies. You may ask yourself: Do I need to rip and replace my existing storage? What is the best way to integrate both? What benefits do I receive? Shifting weather patterns across the globe force us to re-evaluate data protection practices in locations we once thought immune from hurricanes, flooding and other natural disasters. Offsite data replication combined with advanced site recovery methods should top your list. If you’re working in a technology role in the healthcare field, whether you’re in a hospital or clinic, working in a company producing the latest breakthrough treatment or working in an organization helping patients on the financial side of their health, you know that you have unique technology needs that many other companies may not. You also know that you need technology that enables rather than hinders you, and you may be wondering how some leading-edge healthcare organizations are making this happen right now. ActualTech Media is partnering with some of today’s leading enterprise IT vendors to bring you a very special EcoCast focused exclusively on healthcare IT. Audience members that have an affiliation with any area of healthcare, medical, life sciences, or similar areas will be treated to a very special healthcare-specific presentation from data center technology provider DataCore. Join this webinar to learn how today’s leading healthcare organizations are using software-defined storage to tackle the top challenges in Healthcare IT by delivering uninterrupted data access, massive architectural scale-out, and game-changing application performance. Nevertheless, with the VMware certified, universal vSphere APIs for Storage Awareness (VASA) provider from DataCore you can easily achieve that with full VMware support and without VVol certified hardware today. Use of local discs alone or in combination with other storage arrays as part of the Virtual Volumes datastore would even be sufficient. Join our brief webinar and Q&A to learn how to make this happen. While hyperconvergence aims to make the datacenter more efficient, hyperconvergence can also be confusing at times, due to the numerous forms of HCI, the different approaches, and the varying levels of efficiency that can be gained. In this exclusive educational event, we’ll cover what hyperconvergence really is, how it works from install to administration, and how it can help your company. We’ll take questions from you, our audience, on this registration form and answer those questions during the live event. Join hyperconvergence expert Steve Hunt and moderator and vExpert, David Davis to get all your HCI questions answered on this live event! Did you know that 22% of data center outages are caused by human error? Or that 10% are caused by weather incidents? The impact of an unexpected outage for just a few hours or even days could be catastrophic to your business. How would you like to minimize or even eliminate these business interruptions, and more? Hyperconverged systems offer a great deal of promise and yet come with a set of limitations. While they allow enterprises to re-integrate system components into a single enclosure and reduce the physical complexity, floor space and cost of supporting a workload in the data center, they also often will not support existing storage in local SANs or offered by cloud service providers. • What are hyperconverged systems? • What challenges do they pose? • What should the ideal solution to those challenges look like? Running mission-critical applications and providing continuous access to data are the lifeblood of any healthcare organization. That’s why a business continuity plan is uniquely important to the healthcare sector. Hear directly from Maimonides Medical Center’s CTO Gabriel Sandu as he shares how their organization uses software-defined storage as a strategic solution to achieve their business continuity plans. DataCore has been assisting many hospitals and healthcare organizations throughout the world in building upon their continuity planning efforts. During this webinar, our technical business continuity experts will walk you through real-life healthcare disaster incidents. They will share how major hospitals have survived hurricanes, floods, power outages and building failures by using software-defined storage to provide uninterrupted operations to applications and critical medical data systems during crisis events. Join this session and learn how DataCore’s software empowers business continuity for healthcare organizations such as New York-Presbyterian, Mount Sinai, Maimonides Medical Center, and Englewood Hospital and Medical Center. Flash storage technologies will continue to be a front-runner in 2018 for storage vendors and consumers, however why is it that only 2% of data centers have gone all flash? What are the challenges that storage providers and data center infrastructure managers are still facing with flash, despite it's importance in the marketplace? In the age of digital transformation, IT Infrastructure must embrace new technologies and software-defined storage systems, while still maintaining server and data center performance. Organizations around the world are experiencing the benefits of increased performance, continuous business operations and lower costs through server consolidation and virtualization. Many of them are now evaluating Hyper-converged systems and Software-Defined Storage to develop their next-generation storage architectures. 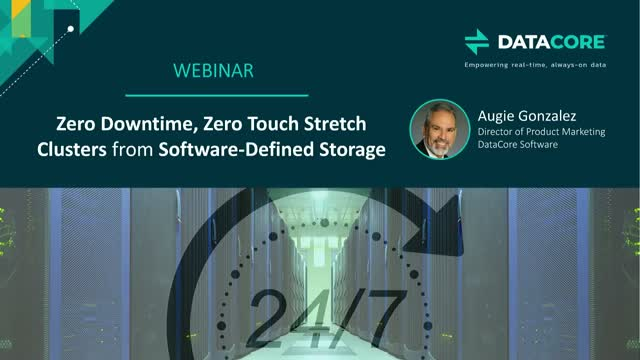 Join this channel to hear industry and technical experts discuss the value of Hyper-converged and Software-Defined Storage and how you can take advantage of these technologies.